Print 17 May Be Over But the Printerverse Continues! As previously announced, I rode a CMYK rainbow of fun and friendship to Print 17. It went fast, but I’m still savoring the afterglow of the camaraderie, information sharing, and alien-approved ridiculousness. I got exactly what I wanted out of the event: met the fleshy avatars of digital #PrintChat friends, made new connections, opened new opportunities, and expanded my mental map of the Printerverse. I also got a cool rocket pen for putting red to what I read as a technical writer! Although I shouldn’t say this since I saw the original Star Wars movies for the first time as an adult and in chronological order, finally making it to Print 17, and some of the experiences, made me feel like I was growing as a Printerverse padawan. Someone said I knew stuff. Or at least sounded like I knew stuff. Progress! And they acknowledged my bold fashion sense. Which is another win. 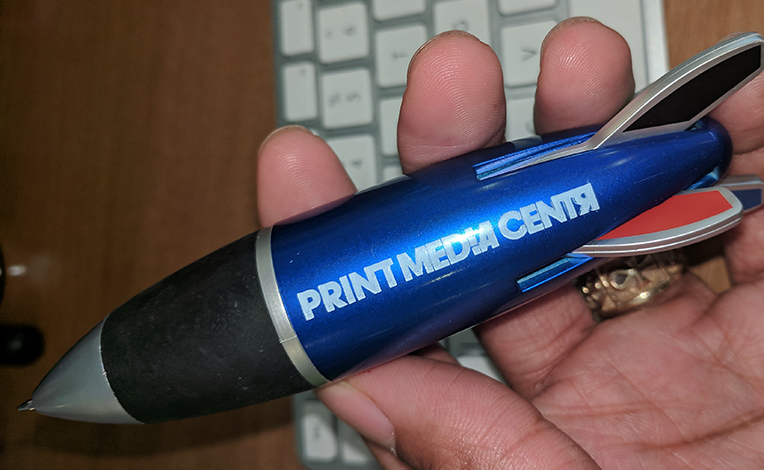 I’m ignoring the implications of the “but” since my beloved deely-boppers were hard-earned through #PrintChat witticisms and playing the role of SCANDY, even-tempered recorder of all who entered the Printerverse booth. I wore them EVERYWHERE. But back to knowing stuff. Print 17 afforded opportunities for professionals and students active in printing, publishing, and graphic communications to learn about technologies, ideas, and partners that might keep them ahead of the next “wave” commentators like Dr. Joe Webb foresee as coming our way. In the Printerverse booth, where I spent most of my time, Deborah Corn convened and moderated a steady stream of educational events featuring an Intergalactic Alliance of Printerverse personalities and technology providers. There was a lot, and if you’re reading this, you must have missed something. I was there and I couldn’t catch everything! Thanks to Mandy Johnston, our videographer, we can supplement our limited human memory, awareness, and bodily presence with videos! Over at the Print Media Centr YouTube channel, you will find a Print 17 playlist with all of the Printerverse panels and special events. There are the “Mover and Shaker” videos that each feature a series of one-on-one interviews with technology providers (sitting among inflated aliens, of course). There are case study presentations and discussions with customers and representatives of companies like Canon, HP, Konica Minolta, Memjet, Pitney Bowes, and Solimar. There are panels covering a range of subjects including inkjet, finishing, personalization, paper, social media, integration, workflow automation and more. We can also watch videos from the sixth annual Girls Who Print Day celebration along with interviews with thought-leaders like Sabine Geldermann of drupa, Trish Witkowski of FoldFactory, Michael Makin of Printing Industries of America, and Dr. Joe Webb, author of The Third Wave. It’s a wealth of “Printspiration” and it’s ours. For free. Go get it! Andy Solages connects people and organizations with technologies to improve professional experiences and business results. 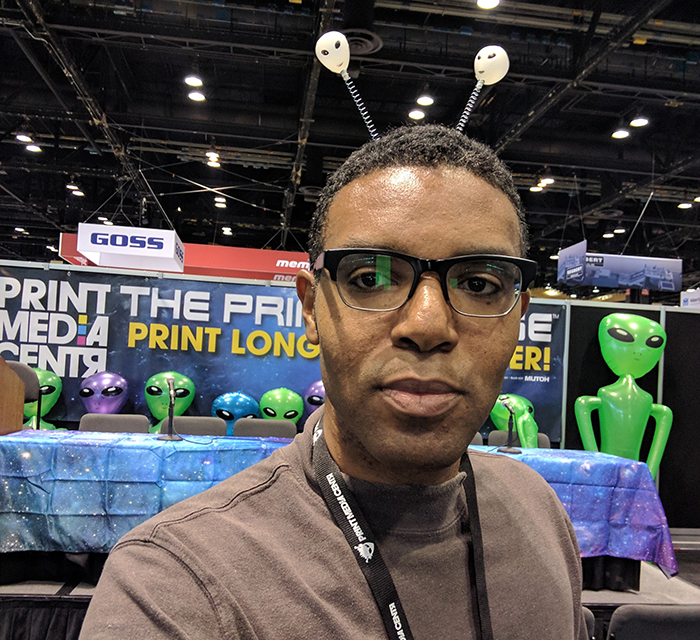 Andy is a monthly contributor to Print Media Centr’s News from The Printerverse and a regular participant in #PrintChat on Twitter.